I'm a HUGE Lincoln buff, always have been. In 2006, I decided to combine my love of Lincoln and the paranormal. 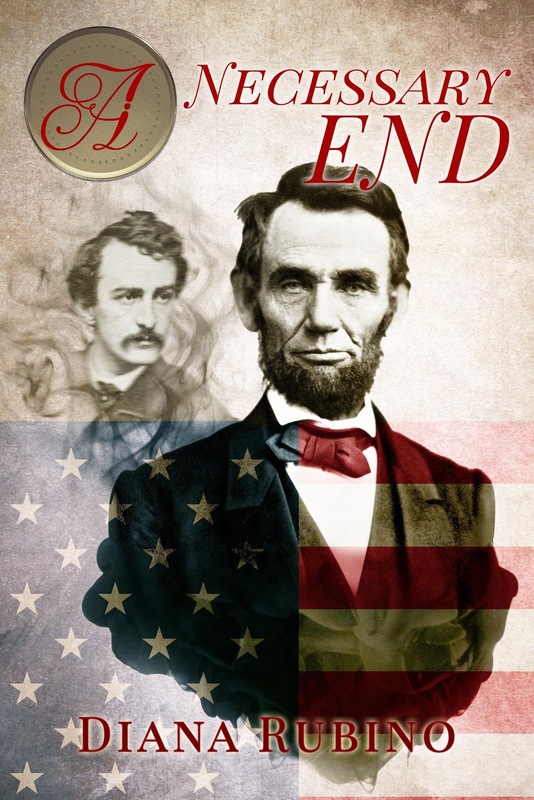 I began researching A NECESSARY END, my paranormal twist on John Wilkes Booth's insane plot to assassinate President Lincoln. It contains no fictional characters. I joined The Surratt Society, based in Maryland, and attended their conferences and tours. Mary Surratt was one of Booth's conspirators--the motley crew met at her Washington D.C. boarding house to hatch their plot. She was tried, convicted and hanged with three others. Through the Surratt Society I met several Lincoln/Booth/Civil War experts. One lady I’ll never forget meeting is Marjorie “Peg” Page, who by all accounts except definitive DNA testing, is John Wilkes Booth’s great granddaughter. Abraham Lincoln has fascinated me since I was eight years old. I don’t know what got me started, but it might’ve been a book which I still have titled The Life of Abraham Lincoln, Volume 1, written in 1895. When I was in 3rdgrade, in the mid-60s (which shows how long I’ve been a Lincoln nut), my teacher asked us to bring a book to school from home, for a show & tell. My mother suggested I bring this Lincoln book, which even in 1966 was in bad shape—yellowed, stiffened strips of Scotch tape barely held the covers to the spine. With the wisdom of an 8-year-old that sadly, all of us outgrow, I demurred, saying, “This old book? She’ll think we’re poor!” My mother corrected me: “No, she’ll think we’re rich. Books like this are rare.” Then she proceeded to tape it up some more. Those 47-year-old Scotch tape fragments adhere to the book’s spine and pages to this day. My teacher, Miss Cohen, was duly impressed. I treasure that book to this day, and it’s one of many on my “Lincoln shelf” which holds books about our murdered president, his wife Mary, his assassin John Wilkes Booth and his family, the “Mad Booths of Maryland” and the conspirators who faced the gallows or years of hard labor because Booth, their charismatic leader, sucked these poor impressionable souls into his insane plot. After writing 8 historicals set in England and New York City, I wanted to indulge my passion for Lincoln-lore. I began researching in depth about Lincoln’s life, his presidency, his role in the Civil War, and Booth’s plans to first kidnap him, and then to assassinate him. A NECESSARY END combined two genres I’m passionate about—history and paranormal.My trips to Lincoln's home and tomb in Springfield, Illinois, Gettysburg, Ford’s Theater, and the house he died in, Petersen House, brought me close to Mr. Lincoln’s spirit. My travels also acquainted me with Booth’s brother Edwin, the most famous actor of his time, and his unconventional family. A recording of Edwin’s voice reciting Shakespeare on one of Edison’s wax cylinders still exists. Click here for Edwin Booth's recording. My paranormal experience includes investigations at several haunted homes, restaurants and graveyards. I’ve never seen a ghost, but I’ve received responses to my questions with my dowsing rods. A NECESSARY END is on sale for 99 cents for Kindle until July 22.